ZWSOFT provides flexible licensing choices. Learn about the various types of ZW3D licenses, and decide which one is right for you and your organization. If you have already purchased a license, learn how to upgrade your license. Licensing options defined according to the license number and method of managing the licenses: stand-alone or network. Licensing options defined according to the licensing medium: soft-key or dongle. 1. Stand-Alone version is an ideal licensing option for small offices and dedicated users, no network connectivity required. 2. Floating Licenses are not tied to a particular workstation, so this method provides a flexible and efficient approach for users who run more than one ZWSOFT product, run ZWSOFT products intermittently, or frequently change physical locations. 3. License Borrowing enables the workstation to use a copy of the network license without connecting to the server. This enables the workstation to work outside of the office. 4. Deployment Wizard enables the administrator to create an installation image for deployment. 5. Network licensing requires a LAN Connection. The workstations need to connect to the licensing server via LAN to enable floating licenses. This configuration requires a reliable, low-latency network connection to maintain the link between the workstation and server. 6. Virtual Private Network (VPN) setting enables long-distance licensing. VPN licensing is an ideal way for multinational companies to manage their license(s). 7. Soft-key is a licensing option that enables transferring licenses among different computers easily. This option requires internet, and it is ideal for different computers in different locations. 8. Compared with dongle licensing, it is more convenient to change your licensing option. For example, if you wish to switch to the profession version from the standard version, switch to a network version from a stand-alone version, or need more copies for one network license, it is much easier to just apply for another license rather than make an exchange for another dongle which would require time to process and deliver. Activate the license in the server after installing “License Manager” on the server. Configure the server with the step-by-step instruction from the built-in ZW3D Help file. Run the “License Manager” from the Windows Start menu ‘Start> All Programs>ZWSOFT>ZW3D 2019>LicenseManager’. Add the Soft Key license by inputting the IP address of the server which owns the ZW3D license. If you are using the ZW3D trial version, you could try all the CAD/CAM functionalities except for 4-5X milling. But after 30 days, the open, save, print, import, export and post-process functions will be disabled. Provide the reseller with the Activation ID of your previous ZW3D (referred to as old ID). Activation ID is 24-bit serial number. Obtain the new Activation ID for ZW3D 2019 (referred to as new ID). Before using the new ID to activate ZW3D 2019, return the old ID to our Licensing Center. Download the latest version of ZW3D 2019, and then install it. Run ZW3D as administrator and use ZW3D 2019 Activation ID to activate ZW3D 2019. The new ID of upgraded soft-key license is generated based on the old ID. So the old ID must be returned before you apply the new ID. After the new ID is activated, the old ID will be invalid. The ZW3D 2019 Activation ID can be used to activate both ZW3D 2019 and ZW3D previous versions. On the same computer, after ZW3D 2019 is activated, ZW3D previous versions will also be activated automatically. Uninstall the previous version of ZW3D Network License Manager (Soft-key). Down the latest version of Soft-key Network License Manager Setup and then install it. Launch Network License Manager (Soft-Key) as administrator to activate the network license on the server. Configuring the server to make it begin serving. Run ZW3D as administrator and use the ZW3D 2019 network license from the server. The ZW3D 2019 Activation ID can only be used to activate ZW3D 2019. Provide your local reseller with the product ID of your dongle. Product ID is 8-bit serial number. Product ID is available when the dongle is plugged into the computer. Obtain the Activation ID of ZW3D 2019 from the reseller. version needs a different activation ID. If you don't have them, you can apply to ZW3D local reseller or ZWSOFT for activation ID. No need to send the dongle to the reseller. For the upgraded network dongle of ZW3D 2019, it works only for ZW3D 2019. Provide your local reseller with the product ID of your dongle. Obtain the Activation ID of ZW3D 2013 from the reseller. Download the latest version of ZW3D 2013, and then install it. Please be sure to download the small package to update the dongle information. Plug the dongle into USB interface and then run UpgradeDongle.exe. Input 'y' to read, analyze and update the dongle. After successful update, you will get the product information according to the dongle, such as the following figure. For the upgraded stand-alone dongle of ZW3D 2012, it also works for previous ZW3D 2010, ZW3D 2011. Each version needs a different activation ID. If you don't have them, you can apply to ZW3D l ocal reseller or ZWSOFT for activation ID. 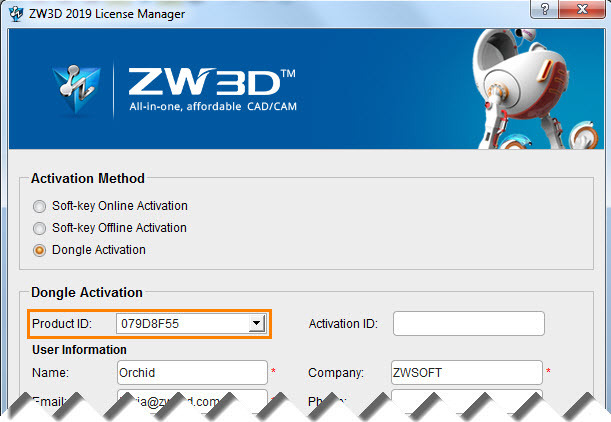 Obtain the Activation ID of ZW3D 2012 from the reseller. Uninstall the previous version of ZW3D Network License Manager (Dongle). Down the latest version of Dongle Network License Manager Setup and then install it. Launch Network License Manager (Dongle) as administrator to activate the network license on the server. 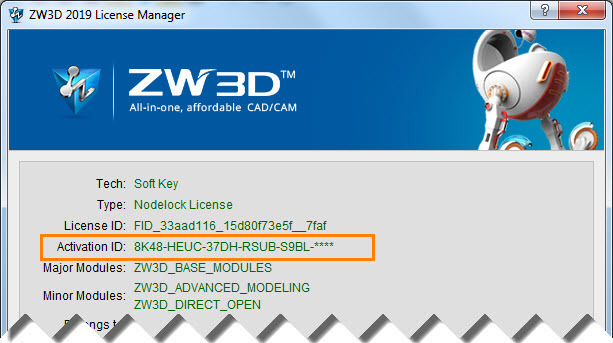 Download the latest version of ZW3D 2012, and then install it. Run ZW3D as administrator and use the ZW3D 2012 network license from the server. For the upgraded network dongle of ZW3D 2012, it works only for ZW3D 2012. Q1: What are necessaries for license activation? A：The following conditions are necessary for license activation. Make sure that the installation folder has write access. If it doesn't, the error message will display when activating the license.